Got white and red base paint coats on over last few weeks. 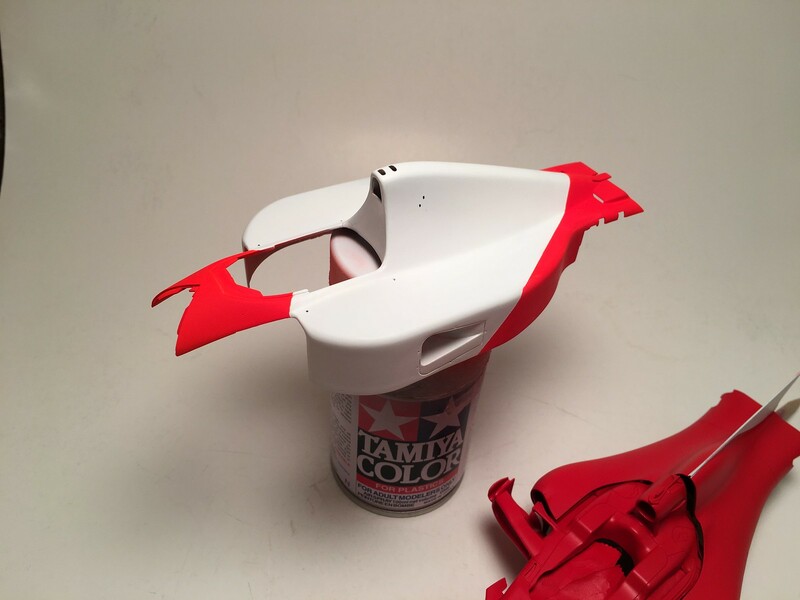 I’ve used masks provided in the kit for the fin on engine cover. Zero matched red went on reasonably well. It might not be 100% even, but close enough. Clear coat is going to be next, before I could mask again and spray some semi-gloss black. After SG black is applied, I should be able to switch focus to applying decals for the main livery and CF decals as well. I’ve also painted floor, gearbox and number of suspension pats in new Zero carbon paint. It’s not a direct replacement for CF decals and does not provide CF patterns out of the jar. But I will use it as base for CF decals and probably even leave it exposed as is on some parts, that I won’t apply CF decals to. The likes of brake ducts, underside of the floor and probably most of the gearbox casing. After body was stripped off of paint from my previous attempt, it took a while to get it primed and painted base white. Work on other projects got in a way. But last weekend I got it masked and was able to put fluo orange on. In attempt to minimize paint bleeds under masking tape, I’ve “sealed” masks with one more coat of base white. In the end it did not come out perfect, but it’s not too bad either. 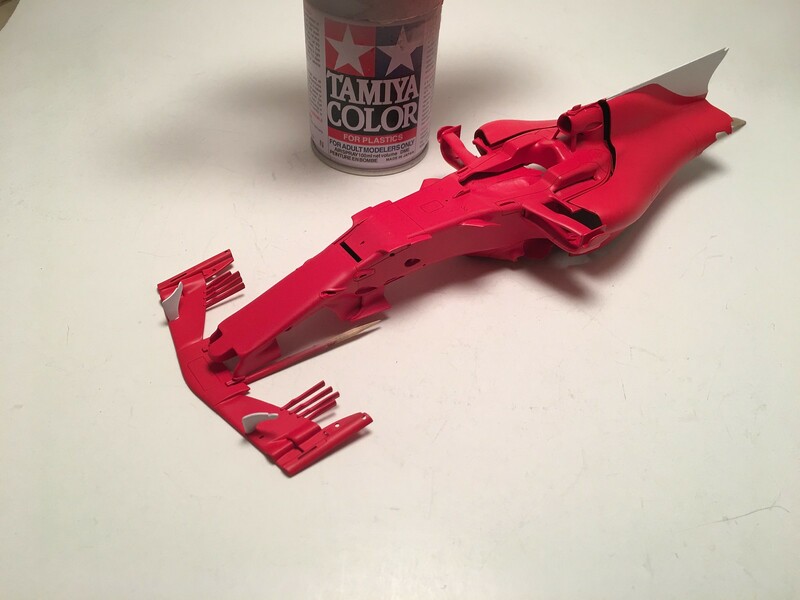 I was able to polish some overspray, bleeds and orange peal spots. So, I am ok with it and it will have to do it for this build. Need to get thin clear coat on top of base paint, before I could apply decals. Color is a bit of on the photo made with my cell phone. I will get proper white balanced photos after clear is applied and true colors will show.